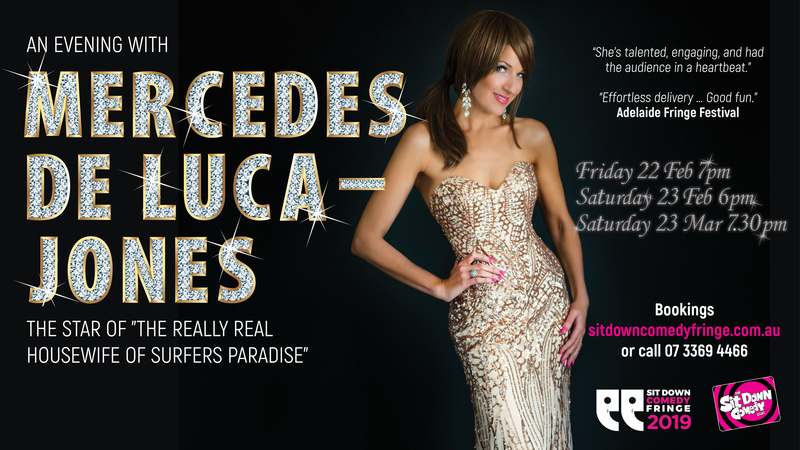 Mercedes DeLuca-Jones returns to the Sit Down Comedy Club by popular demand in ‘An Evening with Mercedes DeLuca-Jones’. Following a year at the Betty Ford Clinic after unceremoniously ‘loosing’ her husband she acquired on The Batchelorette (rumour has it he was sited in Mexico with Olivia NJ’s ex) The Really Real Housewife star is back to her acid tongued former glory! Bring your friends (especially the single ones) as Mercedes serves up an evening of insights into marriage, divorce, affairs, mega stardom, toy boys and her latest obsession -on line dating! There may even be some match making, Mercedes style-hold onto your hats kids!